Was Shakespeare really Shakespeare, or was there another author behind the plays? Many scholars have reason to believe that there was another writer who used the actor from Stratford as a pen name. 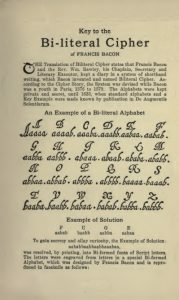 Sir Francis Bacon is considered by some to be the most likely candidate for this mystery author, and a cipher that Bacon invented in his youth may be the key to proving it. Some claim that Bacon used his bi-literal cipher in the handwritten works of Shakespeare to secretly sign his name to his work. A few even believe that his cipher hides an entire hidden history. So, what were Shakespeare’s secrets? Listen to find out. Also, check out the links below for more information on Sir Francis Bacon and his ciphers. Alexander Blu. "Mystical Background-Mysterious and Melodic Music." Rec. 7 Jan. 2015. Mystical Background-Mysterious and Melodic Music. N.d. Orange Free Sounds. Web. 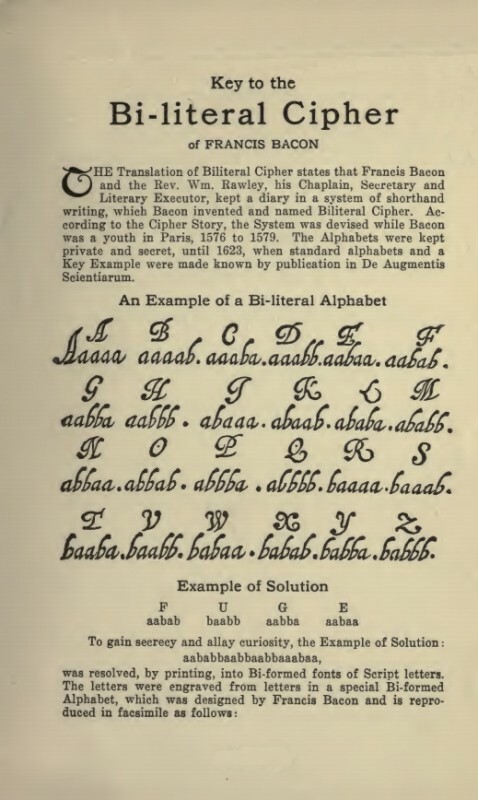 "The Baconian Cipher." Milford Times 1 Dec. 1900: n. pag. Web. "Ciphers of Francis Bacon." The Francis Bacon Research Trust Gateways to Wisdom. Francis Bacon Research Trust, n.d. Web. Davis, Kristin. "Shakespeare's Secrets: A Hidden Cipher in Literature's Greatest Works?" Cryptography. WordPress, n.d. Web. Donnelly, Ignatius. The Great Cryptogram: Francis Bacon's Cipher in the So-called Shakespeare Plays. Vol. 2. 2 vols. N.p. : AMS, 1972. Print. Gallup, Elizabeth Wells, and William Shakespeare. Concerning the Bi-literal Cypher of Francis Bacon Discovered in His Works by Elizabeth W. Gallup. Pros and Cons of the Controversy. Explanations, Reviews, Criticisms and Replies. N.p. : Detroit, Mich.; Gay & Bird: London, 1916. Print. Holden, Joshua. "Cipher Challenge #3 from Joshua Holden: Binary Ciphers." Princeton University Press Blog. The Trustees of Princeton University, 23 Jan. 2017. Web. Klein, Jürgen. "Francis Bacon." Stanford Encyclopedia of Philosophy. Stanford University, 29 Dec. 2003. Web. Leary, Penn. "A Reply to "The Code That Failed"." Shakespeare Authorship. N.p., 20 July 1996. Web. Leary, Penn. The Second Cryptographic Shakespeare: A Monograph Wherein the Poems and Plays Attributed to William Shakespeare Are Proven to Contain the Enciphered Name of the Concealed Author, Francis Bacon. 2nd ed. N.p. : Westchester House, 1990. Print. Quinn, Ruth. "William F. Friedman -- Master Code-Breaker." US Army. US Army, 6 June 2014. Web. Ross, Terry. "The Code That Failed." Shakespeare Authorship. N.p., n.d. Web. "Shakespeare Authorship 101." Shakespeare Oxford Fellowship. Shakespeare Oxford Fellowship, n.d. Web.